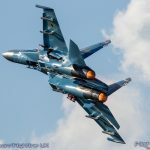 There’s just a week to go until Eastbourne International Airshow zooms back to the UK’s sunniest place with visitors ready to enjoy hours of spectacular flying, seven days of live Radio Airbourne broadcast, 35,000 ice-creams, brand new Picnic on the Proms and a dazzling firework finale! 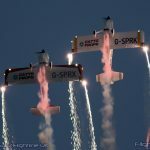 Airbourne returns to Eastbourne seafront next week from 12-15 August and now in its 18th year, promises to be bigger and better than every before with fantastic flying, evening entertainment, arena displays, Bandstand concerts and more! 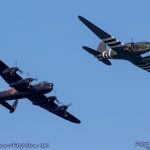 Headlining this year’s free event is four days of displays from the Battle of Britain Memorial Flight, commemorating 70 years since the Battle of Britain was fought out over south east England with Saturday evening offering a special anniversary display. Visitors can look forward an exciting Dogfight re-enactment between the Spitfire and Buchon Messerschmitt 109 in an attack on a pleasure boat before a new evening extravaganza. Crowd favourites the Red Arrows, whose display is sponsored by TravelInsured.co.uk, are back for three days of flying on Thursday, Friday, and Saturday, with a special ground appearance on Saturday afternoon finishing with a flypast on Sunday. 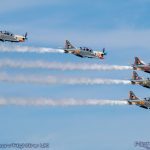 And the Reds will be joined by a top line up of international aircraft over the four days including the Belgian F-16, Eurofighter Typhoon, P-51 Mustang, and Catalina. With such a vast line up of flying, Airbourne is going into the evening on both Friday and Saturday night in 2010. Come Fly With Me! returns on Friday evening with the Typhoon, Gnats, Blades, Spitfire and Hurricane Bomber performing an evening display from 6-8pm while the Swing Street Band perform in the arena playing a variety of music, from Frank Sinatra to Michael Buble! Brand new for 2010, Saturday evening offers another evening extravaganza with Picnic on the Proms. Following the special Battle of Britain 70 display, The Shades of Blue Big Band, part of The Band of the RAF Regiment, will perform in the arena and visitors are invited to bring a picnic to the lawns and chill out as the sun goes down on a busy day at Airbourne. With plenty of reasons for visitors to have their eyes to the skies, there is also lots to look forward to on the ground including the RAF Village on the Western Lawns offering a fascinating insight into life in the Royal Air Force. Children can sit in a replica Red Arrow cockpit or climb aboard a replica Chinook, while the RAF Careers team speak to budding young pilots, and the Mobile Catering Unit carry out field cookery demonstrations. For those who want their own personal soundtrack to the airshow, visitors can buy Airbourne radio headsets from the Information Tent at the event and tune into Radio Airbourne on 87.7FM promising 165 hours of live commentary, pilot interviews, music, weather and travel updates with a programme and radio headset available together for only £6. The airshow opens from 10am – 6pm each day from Thursday 12 – Sunday 15 August, with extended flying until 8pm on Friday, a live band until 8pm on Saturday, and a firework finale launched from Eastbourne Pier at 10pm on Sunday night. 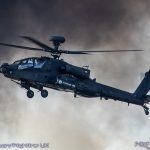 For more information on Airbourne 2010 visit the Airbourne website or telephone 0871 663 0031.